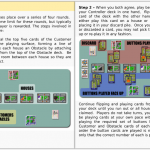 Last summer I released a new game via print and play and thegamecrafter.com. 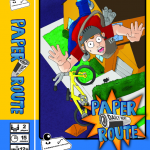 The game, Paper Route, is inspired by the classic Nintendo/Arcade game Paperboy and was requested by my friend Cyrus Kirby of fathergeek.com. Quite a few people downloaded the game and gave it a shot… and a few even bought a copy from The Game Crafter. The problem: way back then, The Game Crafter had only a few box options and they were all less than optimal. The solution: last winter, The Game Crafter released a new box which would fit this game perfectly. 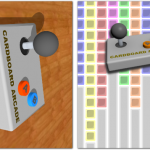 The solution: The guys at Building the Game Podcast asked if they could run a contest using the Cardboard Arcade system the game is built on and give away a copy of the game! 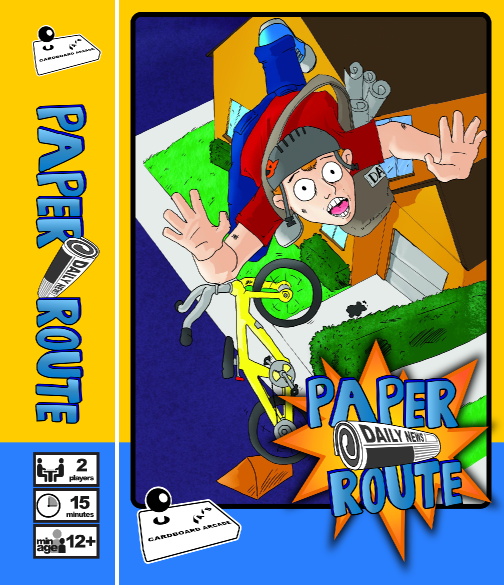 Ever since the Small Pro Box was released by The Game Crafter, I’ve been saying that I’d love to repackage Paper Route in it… but I kept getting sidetracked by other projects. I get distracted easily. Today, that all changes. Go buy a copy now!!! Well, the obvious change is the packaging. I don’t have actual pictures yet, but I’ll be sure to update the site as soon as I do. The old box was huge. Way bigger than it needed to be to hold 140 cards and a couple of tokens. This was the main contributing factor. The new box is also fully printed on all sides, so I can make it look all sorts of attractive. I think I puled that off pretty well. The rules also got updated. The Game Crafter booklets are amazing. They look and feel like fully professional rule books and they have one that fits perfectly in the box. I couldn’t pass on using it. It’s just too darn cool. I dropped the generic life tokens and added cards. Part of this was to help fit the components in the new box… also the life tokens looked terrible. 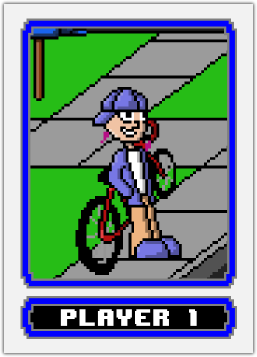 I contracted Martin Cobb (who did all the other 8-bit art) to draw up the life cards, and I’m super happy with the results. The other reason for the cards… well… it has to do with the manufacturing process. Print on demand works in sheets. With The Game Crafter you buy cards in sheets of 18. 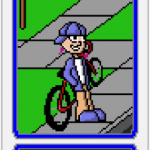 With the old edition of Paper Route, there were 14 wasted cards. This meant that you were paying for 14 cards that you didn’t get. It always bothered me. 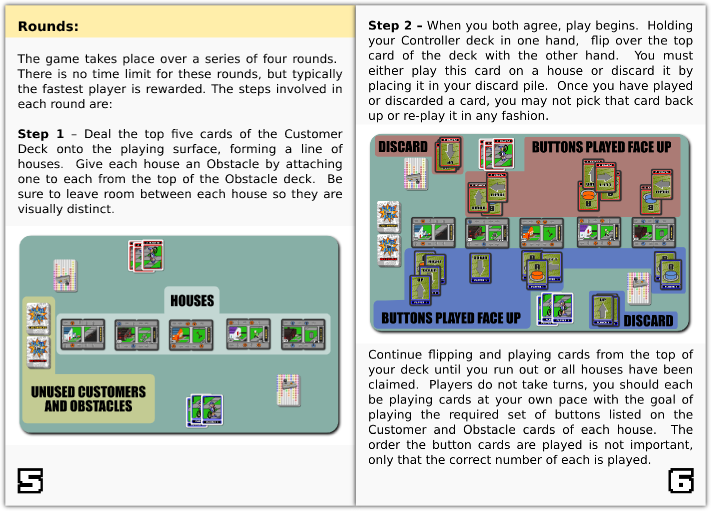 I used up some of those cards for the life cards, and the rest contain the Cardboard Arcade document that used to be in the rules. 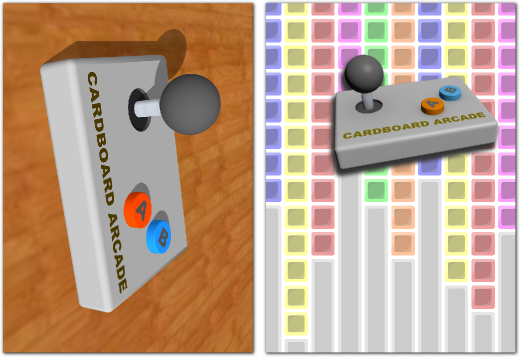 I updated the look of the Cardboard Arcade cards. I never really liked the ugly back design and I wanted something more retro and cool looking. I’m really happy with how they turned out. They make the game look much more attractive all set up on the table. The original design was one of sheer laziness. I did the work in Google Sketchup which doesn’t allow you to export with transparency… so I added a wood texture and called it quits. This time, however, I did a little extra work and asked Mark Major to help me out. He’s an amazing 3D artist, graphic designer, game designer, and good friend, so he happily rendered out the controller for me. Thanks Mark! So, it’s been a long journey for this game. I can finally say I’m proud of the total product and I happily invite you to purchase a copy. Before, I would feel bad for asking you to spend money on an inferior product… now, I think you’re getting a great game at an affordable price which looks and feels as good as it plays. An added benefit of this new packaging is the shipping cost which is greatly reduced. Happy times!